The graph above comes from Calculated Risk, hands down the best economic blog, and far better analysis than I have seen in print anywhere. WSJ, NYT, The Economist, Bloomberg . . . would that your reporting had the insight that comes from CR and Tanta! 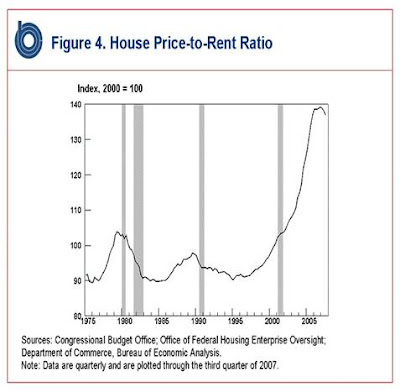 Another favorite, Professor Nouriel Roubini's RGE Monitor, opines that this housing recession may be the worst in the country's history, worse, possibly, than the Great Depression. My own take is that this has been the biggest real estate bubble the US has ever seen, fueled by cheap, easy credit. 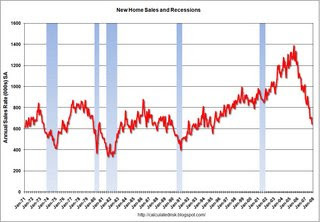 The housing market in 2001, in my view, was just due for a mild correction. After 9/11, however, Bush and Greenspan opened the floodgates, the Fed Funds rate went as close to zero as it's ever been, and prices took off like a rocket. I don't know that things will get as bad as the Great Depression, but this is going to be a painful correction for many. 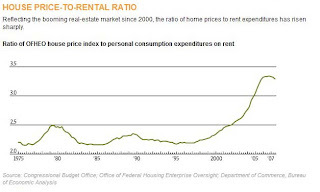 UPDATE: Princeton Economics Professor Paul Krugman blogs at the NYT on the amazing disconnect between the costs of renting and owning in today's market. Look at this chart: If you believe this is sustainable, you are a crazy person. I went to the CB6 Transportation Committee hearing last night to comment on Intro 619 and 620, which aim to crack down on illegal curb cuts. (For the record, although the committee didn't have quorum, those present overwhelmingly favored the measures). Last night was the first time I was able to see the language of the bills (which I wholeheartedly support). Intro 619 operates by adding a clause to a sentence in Section 27-143 (which governs DOB's examination of applications and plans) to expressly forbid the commissioner to allow self-certification of curb cuts. A good start. The commissioner may, at his or her discretion, when the application is submitted by an architect or engineer, designate portions of the examination for limited supervisory check. This sentence allows a horror show of a DOB commissioner, for example, say, Patricia Lancaster, to abdicate responsibility for building plans to a developers hired guns. Intro 619 would limit that power to exclude curb cuts. I would eliminate it altogether and put an end to self-certification once and for all. Chalk it up as one more miserable failure from the hand of Rudy Giuliani. The changes would also create a new bus line, the M13, from the Lower East Side to East Midtown, and would extend the B71 and B77 buses from Brooklyn via the Brooklyn-Battery Tunnel into Manhattan, where they would go to South Ferry. These would be positive changes. splitting the B61. I would have the "61 North" and "61 South" overlap between Jay Street and LICH, to allow people who live near the Navy Yard and work at LICH a one-seat ride. It would also afford better service along Atlantic Avenue to the waterfront. . . . . The problem with the B61 is . . . delays from street traffic and overcrowding from serving too many congestion points. . . . NYCT has addressed a similar problem by splitting the M10 into the M10 and M20; the B61 is a prime candidate for splitting. Anyone who doesn't think so should ride from LICH to the Navy Yard, and also wait for a bus at Jay Street in rush hour, to see for themselves. One of these days I'm going to do just that. Since I ride the subway every day, I'm highly attuned to issues with the subways but not very close to the bus system. But I've been hearing a lot from our good friends in the Hook that bus service needs improvement. Read all about it at Second Avenue Sagas. I'm disappointed, for a variety of reasons. The biggest reason is the failure of imagination this shows up in our leadership. Why the hell didn't Bloomberg use his pull to tie congestion pricing to holding fares at the current level? It's a hard enough to swallow a carrot and stick approach, with Congestion pricing as the stick. What do transit riders get but . . . another stick! No carrots today, people. And Spitzer. The Governor preserved the $2 fare. For who? Daytrippers and tourists, the people who are most likely to pay an increase without skipping a stride? What I'd like to see from the Governor's office is a recognition, in word and deed (and by deed, I mean money) that New York is committed to investing in transit. New York is the second greenest city in America. It's not because of our combined sewer outflows, which violate the Clean Water Act by flooding our coastal waters with raw sewage each and every time it rains. It's certainly not because of the incredible amount of electricity wasted in Times Square and elsewhere every single day. It is because we have a remarkable efficient means of moving people around the city in the form of our subways. But the transit system has many faults, from congested lines, to crumbling infrastructure, to ADA non-compliance, to whole swaths of the city that are under served by transit. Mr. Spitzer, the City is begging for a Governor who will reverse the disastrous neglect of George Pataki. You can be that guy. The Bill of Rights proposed by Councilmen deBlasio and Liu yesterday is a step in the right direction. But for that initiative, or indeed any initiative to get traction, we need to see real leadership from Albany and City Hall. A travel-weary city awaits. Curbed has a post chock full of renderings by West 8, the Dutch firm that reportedly won the design competition for Governor's Island. These renderings are miles above the ones I saw in NY Magazine this Spring/Summer. Two thumbs up if this is the route we're going. I love the topographical elements and the restored wetlands, as well as the promenade with what will be stunning harbor views. UPDATE: Confirmed by the NYT . . . and here I was concerned it was too good to be true. Councilmen Bill deBlasio and John Liu held a press conference today calling on the MTA to establish a Straphangers' "Bill of Rights", including such radical ideas as reliable on-time service and attractively priced fares. Also speaking were Dan Cantor, Executive Director of the Working Families Party, Gene Russianoff of Straphangers campaign, and yours truly. Check out the news tonight, the TV media were out in force. "New York, and Brooklyn in particular, have seen a surge in population and in transit ridership, but investments in transit have not kept pace," said Gary Reilly, Brooklyn Transit Advocate. "If the MTA was as aggressive in seeking money from Albany and the Mayor's office as it is from our bus and subway riders, there wouldn't be a fare crisis. If we're to preserve our status as one of the greenest cities in America, we need Governor Spitzer to commit to state funding for mass transit that will reverse the tragic legacy of neglect left us by the Pataki administration. Can you imagine if your kid brought home a report card full of Cs and Ds, and then not only asked for but demanded a raise in allowance?" NOTE - Having some formatting issues . . . bear with me, thanks. 1. Fares that are affordable and attract riders to use mass transit. 2. Regular, on-time subway service. 3. Immediate and real-time notification of service changes and advisories available to passengers on platforms, in train cars, and via internet and text message with accurate information. 4. Accurate and user-friendly assistance for riders to find alternative means of transportation in situations where service is interrupted. 5. Trains and platforms that are kept clean. 6. A working and understandable public address system on all platforms and in all trains, with in-car announcements alerting passengers to upcoming train stops and platform notifications informing riders of the arrival of the next train. 7. Well-trained, helpful station and train personnel to provide information and directions, as well as establish a human presence in the subways. 8. Working payphones in all stations and access to cellular phone service while on platforms. 9. An MTA website that is user-friendly and can support heavy traffic such as that which may be experienced during an emergency. 10. An environment as safe and secure as possible from crime and terrorism, with such features as an increased presence of uniformed police officers and bright lighting. You've seen it. The New York Times even did an article with pictures last year of the ones on 4th Place. Certain individuals think they are so special and wonderful, that they deserve to pave over the courtyards (which they don't own) in front of their houses and park their cars in them. Meanwhile, the neighbors and the community pay for it with the cheapened, degraded appearance of the block. But Gary! You ask. Isn't that one less car on the streets, jockeying for a space? NO! Because now you are tricked into thinking you'll get a ticket for blocking a legal driveway . . . and parking enforcement will probably be fooled, too. Presentation and discussion of Intro 619, a local law to amend the administrative code for the city of New York, in relation to eliminating professional certification of plans submitted to the Department of Buildings regarding curb cuts and requiring notification of the Community Boards and Council Members upon receipt by the Department of Buildings of an application for a curb cut. Presentation and discussion of Intro 620, a local law to amend the administrative code for the city of New York, in relation to requiring the illegally created curb cuts liable for penalties, requiring the Department of Transportation to restore illegally created curb cuts and providing for the reimbursement to the department for the cost of the work. Presentation and discussion of two new Revocable Consent applications submitted to the Department of Transportation on behalf of P.S. 67 Development LLC for two planted area structures to be erected in front of new buildings at 370 and 372 12th Street (between 6th and 7th Avenues). Essentially, the phone companies have been helping the Bush administration to illegally spy on American citizens, without warrants, since before 9/11. Yes, before 9/11. While the arguments are always thrown out about how this is all to save us Murkins from the terrists, the Bush administration began the lawless spying almost as soon as he was sworn in. And now, Congress, led by the spineless Harry Reid, is considering waving a magic wand and making it all legal. Read Glenn Greenwald for the gory details. I hear that Bill deBlasio is holding a press conference on Tuesday at noon at Union Square Park to unveil a City Council Resolution laying out a Straphanger's Bill of Rights. When: Tuesday 12/18, 12:00 - High Noon! That's all I've got. 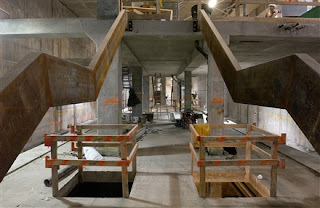 So to pad out this post, here are a couple of cool construction shots taken from the Engineering News Record's 2007 photo contest. 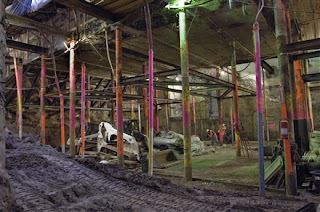 Plenty of cool images there for infrastructure geeks. 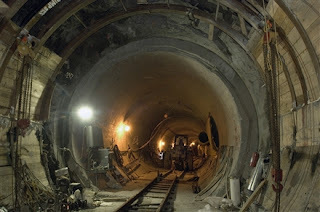 Pictured here are East Side Access, Fulton Street Transit Corridor, and South Ferry, respectively. Get your transit geek on. This last one is my favorite. It looks like a crappy sci-fi film shoot could break out at any moment. This graphic (h/t Calculated Risk) pretty much draws the picture for you. It no longer makes sense to buy when you can rent for far less than the monthly cost of ownership. We left the realm of sanity about 6 years ago. Case in point: The apartment (a condo conversion of a brownstone; walk-up, floor-through) next door to me would rent for perhaps $2500-2700 dollars per month. It sold for nearly $1,000,000. And has monthly maintenance and taxes. Does that make financial sense to you? Crunch the numbers any way you want, it simply doesn't add up. At certain price levels, owning is more attractive than renting. The disastrous fiscal policies of the Bush administration have created a massive real estate bubble in the US (yes, even in Brooklyn) and the next few years will not be pretty. A part of me died when I read this article. So we heard yesterday that Buildings Department commish Patricia Lancaster entered into a secret, sweetheart deal with infamous architect (what is the opposite of "starchitect"?) Robert Scarano. Essentially, Lancaster would sweep Scarano's various misdeeds under the rug. Bloomberg spokesman John Gallagher did not respond to a question about whether the mayor knew of the Scarano deal before it was signed. He said such nondisclosure deals since have been banned. This stinks to high hell. We need action, including an investigation of Ms. Lancaster's dealings with Scarano. More broadly speaking, we need to reverse the damage done by years of Republican maladministration, starting with Rudy Giuliani's ill-advised self-certification program. It was self-certification that allowed Scarano to get away with the worst of his abuses. We need a buildings Department with some teeth! UPDATE: Gowanus Lounge has the response from DOB. What follows are the top ten complaints for another C-minus grade joining a long line of mediocre grades. After the jump, the full grade breakdown. Ben also notes the potential for F express/ V local service once the viaduct work is complete - the holy grail of Culver Line service, which is potentially in our grasp. Make sure to let the MTA and your elected officials hear, regularly, how important this is to Brooklyn. Holy cow . . . NYT columnist Tom Friedman actually wrote a decent column. After 9/11 we had an unprecedented opportunity to make this country a better, safer place. Too bad we had George W. Bush. Thanks, Scalia! Unbelievable. Thomas Kontogiannis, Queens "businessman", convicted briber, admitted money launderer, and shadowy financier about town, has apparently run a $100 Million mortgage fraud in Queens while on trial in federal court for laundering bribes to a sitting US Congressman. The unbelievable part is, this is not newsworthy enough for the New York Times, The Daily News, The New York Post, or Newsday to cover. Nor, as far as I can tell, any of the local borough-centric papers. What the hell is up with that? Why do I have to read a California paper to get this news? This is a major national story, and the local media . . . *crickets*.